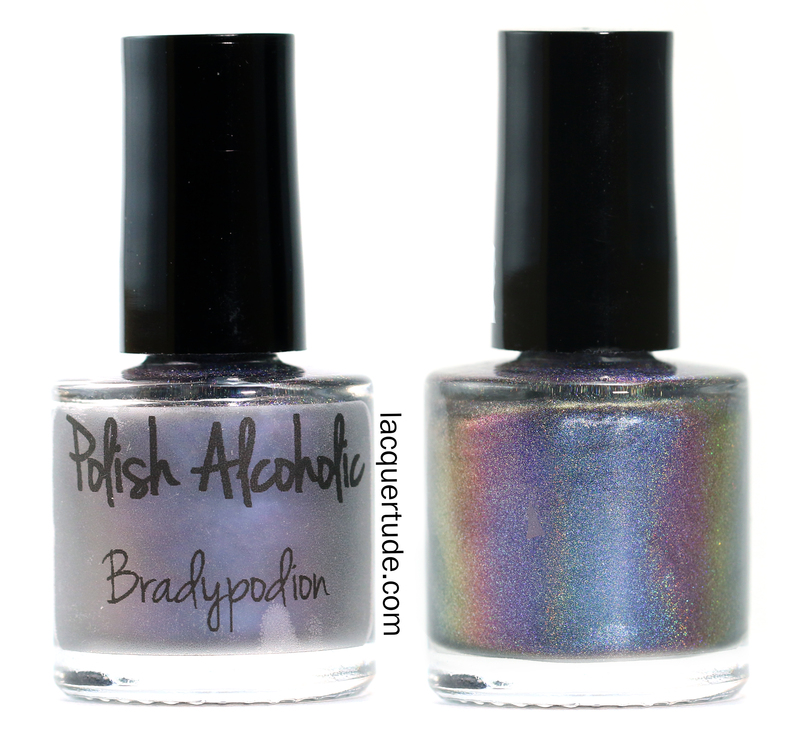 This post is dedicated to just one polish: Bradypodion a drop dead gorgeous multichrome holographic polish that had me at first coat! Ok, that’s enough gushing for now, let’s get back to Bradypodion! Be ware, there are tons of photos. And I certify that I’m wearing the exact same polish in all the photos! I’m wearing 1 coat over black. You can get this polish opaque in 2-3 coats, but since I love it so much, I decided to save every drop for the future. 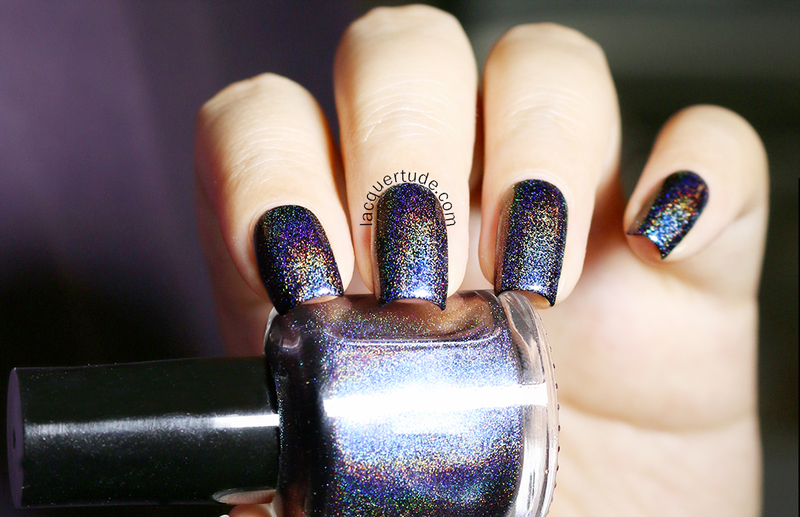 But you can see that just a thin coat over black is enough to show off all of the holographic and multichrome goodness! In this shot, taken in my light box, you can see the blue and purple shifts. Out of the light box, you can really see the crazy holo and the cyan color shift in the center of the nails. Here’s a shift between cyan and purple. It’s so soft and pretty. I really couldn’t help myself. Bradypodion is sooo fascinating that I took photos of my hands and nails in every angle and under all different lighting. Whew, I felt like I was turning into a hand model by the end of it, trying to “find the light” everywhere I went. My husband was chuckling as he saw me working like a busy-bee, only to stop every now and then when the light caught the nails in just the right way and froze me there, staring at my glowy nails, breathless and in love! So, what do you think? Have I convinced you with my gazillion+1 photos? Well, I strongly suggest you take a look at the Polish Alcoholic shop on Etsy here. Sabrina has a couple of deals going on right now, so it’s the perfect time to make purchases! 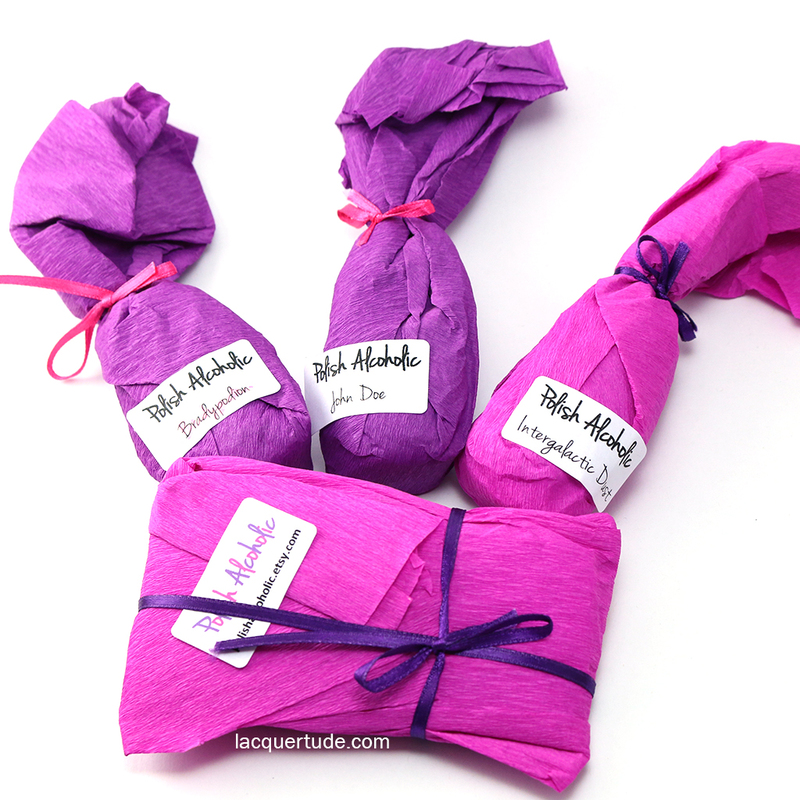 You’ll get a free cuticle oil when buying 2 or more polishes? Also, everyone gets 10% off their order by using coupon code ’10OFF’ at check out. No minimum required. I believe both deals are effective until the end of the month. Make sure you don’t miss out! There’s also a monthly newsletter (e-mail) to inform everyone about new releases and special offers. You can subscribe here. It’s for free and non-spamming 🙂 I know I’m going on the Polish Alcoholic train! How about you? Thank you so much for reading and see you soon!